Jacobs University is based in the north of Bremen—a city with a maritime atmosphere and over 1,200 years of history. It is home to the “Freimarkt,” Germany’s oldest fun fair, and the traditional Christmas Market is a popular destination. 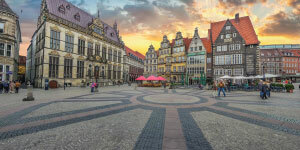 Centrally located in Europe, with an international airport close to the city center, Bremen is an ideal starting point for trips to destinations such as Hamburg, Berlin, Paris, Rome, and Amsterdam. Type of School: Jacobs University is a private English-speaking university offering the highest standards of research and teaching. Size of Campus: The 80-acre campus houses approximately 60,300 square feet of laboratory space and four residential colleges. Number of Faculty: More than 100 professors and lecturers provide individualized assistance, as each student is assigned a faculty member to act as their personal academic advisor. Geographic Diversity: Students from over 100 countries attend Jacobs University (approximately 75% international students). Please check current Euro exchange rates for accurate fees. Financial Aid: Individualized financial aid packages involving grants, scholarships, and tuition deferrals assist qualified applicants for undergraduate programs in commencing their studies at Jacobs University. • 77% live in Europe (41% in Germany). • 94% are employed or pursuing graduate studies. • 90% would recommend the University to others. Located in northern Germany,Jacobs University is one of the country’s most inspiring universities, where students from all over the world study in a diverse, stimulating, and rigorous research environment. Founded in 2001, the privateEnglish-speaking university has morethan 1,400 students from over 100 countries who currently find their home away from home on its residential campus. By providing an education that transcends disciplines and cultural boundaries, Jacobs University prepares theleaders of tomorrow to responsibly meet global challenges. Jacobs University is a research-oriented, state-accredited university with a broadportfolio of pre-degree, undergraduate, and graduate programs ranging from the Natural Sciences, Mathematics, and Engineering to the Social Sciences and Economics. The Foundation Year is a tailor-made, one-year preparatory program. Students can use this year for orientation and skill building. The undergraduate programs prepare students for a successful academic and professional career in three years. Students have the option to pick their own majors and minors and combine different subjects and fields of study. At Jacobs University, the student-faculty ratio is a low 14:1, meaningfaculty members are able to effectively mentor and advise each student. Students are actively involved in researchfrom their first year of study while having access to modern lab facilities and state-of-the-art technology. An interdisciplinary approach is one of the core elements of a Jacobs University education. Study modules cover various aspects of academic fields, reflecting the complex nature of interconnected topics and global challenges. The University’s reputation speaks for itself, with top achievements in the THE World University Rankings, the CHE-Ranking of higher education institutions in Germany, and the U-Multirank. Jacobs University is a residential university that unites living and learning on an 80-acre green, tree-shaded campus. Students live in one of four residential colleges consisting of modern two-bedroom apartments with shared bathroom facilities. Each college has its own study areas, group meeting rooms, and recreational lounges as well as its own cafeteria. 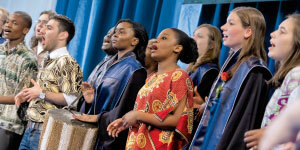 Jacobs University offers many social and cultural activities for students outside the classroom. The variety of student-driven events during the year ranges from cultural festivals such as Deepawali Festival of Lights and Lunar New Year to educational events such as Country Information Days—all hallmarks of its vibrant campus community. In addition, the availability of a variety of student clubs, ranging from arts to sports to community groups,provides further opportunity to foster students’ development of interpersonal and intercultural competencies. Academic life is further enhanced by various campus facilities, including a fitness center and indoor rowing tank, dance rooms, the campus Interfaith House, the Cinema, the Music Lab, and TheaterSpace. Jacobs University offers outstanding career opportunities worldwide. Graduates of Jacobs University follow a variety of professional and academic career paths all over the world. Google, Microsoft, Roche, KPMG, Daimler, and Amazon are among the top 10 employers of our alumni. Events such as the annual Career Fair and Homecoming Career Symposium offer networking opportunities to students by bringing global, national, and local companies and institutions to Jacobs University. In addition, multinational players such as Facebook, Microsoft, AB InBev, EON, McKinsey, Accenture, and Roche conduct special recruiting events directly on campus. Many students also choose to pursue further graduate or professional studies at some of the world’s most prestigious universities, including Harvard, Yale, Johns Hopkins, Oxford, and Cambridge.